We know Godric's Hollow is in the far west, because Hagrid collected baby Harry from the ruins of his parents' house in Godric's Hollow and carried him to Surrey, and en route they passed over Bristol – Harry having had time to lose interest and get ready to fall asleep in between. Since Bristol is more or less exactly due west of London, and of the Spelthorne/Runnymede area of Surrey where Little Whinging is probably situated, it would make little sense to pass over Bristol en route to Little Whinging if Godric's Hollow were north or south of Bristol and none at all if it were east of it: it must be further west. We are also told that the village is in the "West Country", with capital letters. 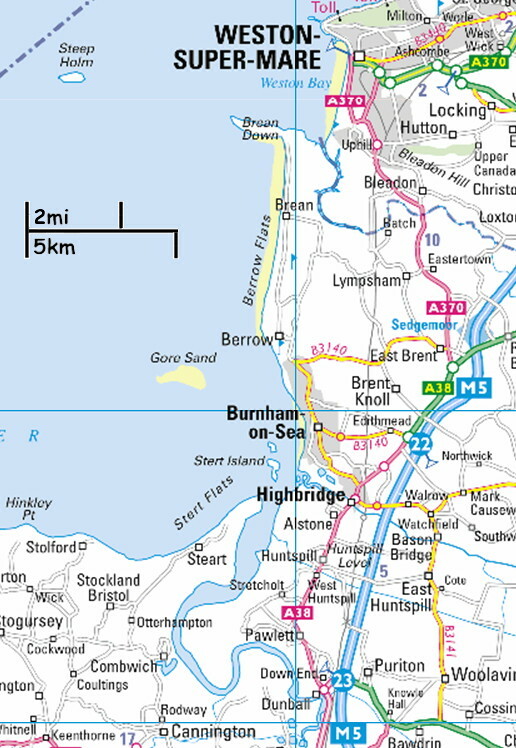 That has a specific meaning – it means that it's in the far south-west of England or in Cornwall (which is part of England for most administrative purposes, but a separate country culturally), on the projection of land which sticks out from Great Britain at bottom-left; not in South Wales or Eire, which would otherwise have been a possibility. However, the fact that the village is called after somebody with an Anglo-Saxon name means it's less likely that it is in the primarily Celtic county of Cornwall, where places tend to have names like Mevagissey, Goonabam, Bohortha and, memorably, Splat, Gweek and Feock, and more likely to be in Devon, Dorset or Somerset where the names tend to be more English-sounding, or in some cases Latin or Norman French, although not necessarily any less strange. It's in the English West Country that we find villages called, for example, Queen Camel and Ryme Intrinsica. We can also say that Godric's Hollow is probably towards the north side of the West Country, or at any rate not on the southern side, because if it were on the south side then going via Bristol would involve a considerable detour. That pretty-much rules out Dorset. Hagrid also refers to the possibility of Sirius (whom he believes at that point to have been the Potters' betrayer) taking Harry "halfway out to sea" and then dropping him. If Godric's Hollow were on or near open ocean it would make no sense to say "halfway out to sea" – anywhere over the water would be "to sea" and you'd expect Hagrid to say e.g. "a mile out to sea". The same if Godric's Hollow is inland, and Hagrid is thinking of Harry being carried to the nearest open water – he'd be either over the sea, or not over it, not halfway out to it. Nor is it an expression you'd expect to use of dropping someone in a river, unless it was the mouth of a wide tidal river like the Thames. The phrase only makes sense if Hagrid is thinking of Harry being carried over a body of water which leads into the sea but doesn't quite count as "to sea" in itself. That basically means that Godric's Hollow is near an estuary (or a tidal loch, possibly, but there aren't any in that area). For the stretch of coast along the north side of the West Country - that is, the area of the West Country from which it would make sense to pass over Bristol en route to Surrey - that means that it could be on the major waterway called the Mouth of the Severn or Severn Estuary, or it could be on the Bristol Channel into which the Severn Estuary feeds. Since the Bristol Channel is fairly wide and most people would probably think of it as open water, the Severn Estuary is the better fit. the joint estuary of the Rivers Taw and Torridge just west of Barnstaple; or the Camel Estuary by Padstow and Wadebridge, in north Cornwall. 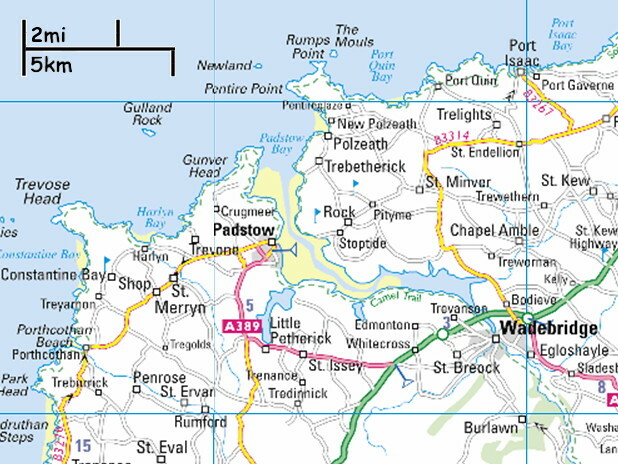 You will see Weston-Super-Mare and Barnstaple on the map of the Severn Estuary, above, and if you look at the map of the West Country then Padstow is halfway down the north-west coast of Cornwall, just below Port Isaac. The Camel Estuary is an atttractive choice because Padstow is the site of the best-preserved traditional May Day celebrations in Britain, but it is the least likely of the three, both because of Godric's Hollow's un-Cornish name and because the Camel Estuary is so far south that a detour via Bristol looks unlikely. 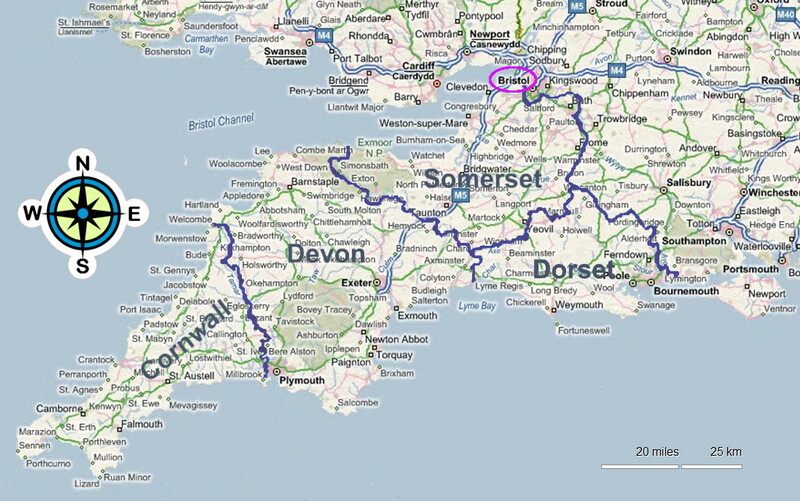 So, to summarise, Godric's Hollow is in either the far south-west of England or, less probably, in Cornwall; it's significantly further west than Bristol (because baby Harry had had time to fall asleep on the journey by the time they reached Bristol); it's on or near either the Severn Estuary or the Bristol Channel, not open ocean, and may also be on one of three smaller estuaries which drain into the Bristol Channel; and it's so placed that it is reasonable to pass over Bristol en route between the village and Surrey. That means it's going to be near the north coast of either Cornwall, Devon or Somerset (but probably not right on the coast, since there's no mention of the sea when we see the village described): of the three, Cornwall is the least likely. Passing over Bristol suggests that Hagrid may have used the motorways (the broad roads shown in mid-blue and white on the West Country map) – first the M5 from Somerset to Bristol, then the M4 from Bristol to London – as a guide. The M4 passes just north of Heathrow Airport, and since Little Whinging must be somewhere around the south-west corner of the airport, Hagrid could follow the motorways all the way from Godric's Hollow to within a couple of miles of the Dursleys' front door. There was a kissing gate at the entrance to the graveyard. Hermione pushed it open as quietly as possible and they edged through it. On either side of the slippery path to the church doors the snow lay deep and untouched. They moved off through the snow, carving deep trenches behind them as they walked round the building, keeping to the shadows beneath the brilliant windows. If he was both near the north coast of the West Country and able to pick up the M5 easily, that means Godric's Hollow is probably in Somerset, in the area of Weston-Super-Mare and Burnham-on-Sea. You can visualise it as something similar to the real-life village of Chilton Trinity, about two miles east of Cannington (see bottom edge of Bridgewater Bay map, above) - except without the sewage works next door. The church at Chilton Trinity matches the description of the one at Godric's Hollow very closely, even to the kissing gate. The village is at once a bit too bunched up and too small to actually be Godric's Hollow, though. 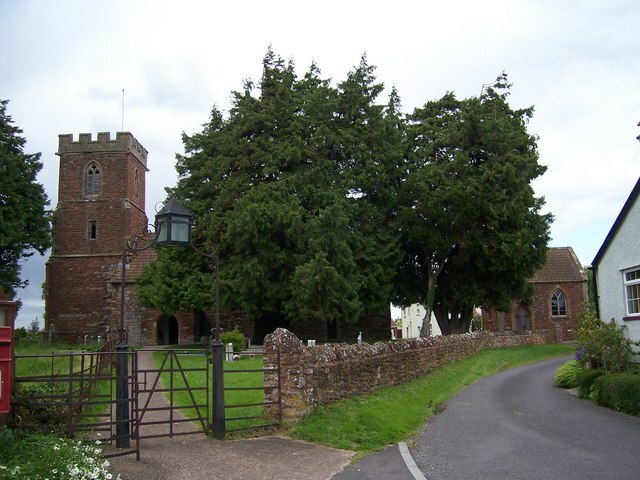 There seem to be no long lanes with houses on them leading off into distant fields: if you're by the church you're right next to the fields anyway, and all the roads which have a substantial number of houses on them seem to curl round so that both ends point into the village. If Godric's Hollow is Chilton Trinity, then in the Potterverse the village expanded some time in the past, and houses spilled out along what in the real world are bare roads with nothing on them but the occasional farm. In fact, it was nearly midnight before the cat moved at all. [cut] a huge motorbike fell out of the air and landed on the road in front of them. The much-discussed missing twenty-six hours or so between the Potters' deaths and Harry's being delivered to the Dursleys, incidentally, isn't such a problem as it first appears. We know that Voldemort came to Godric's Hollow on Hallowe'en night, and we see that children were still about in the streets, so it was probably not later than 10pm. He killed the Potters shortly afterwards. The following night – and we know that it was the following night, and not later the same night, because there was a whole day of back-and-forth owl messages and wizarding celebrations in between – Hagrid delivered Harry to Little Whinging at or just after midnight. We know this because Dumbledore appears and starts talking to McGonagall just before midnight, and Hagrid arrives maybe ten minutes later, judging from the amount of conversation Dumbledore and McGonagall have in between. So the big question is, why did it take Hagrid twenty-six hours to cover the hundred and twenty miles or so between Godric's Hollow and Little Whinging? With Hagrid's long legs he could possibly have walked the distance in that time – but we know he was travelling by motorbike, so why did he average less than five miles an hour? But this is only a problem if we assume Hagrid set out the previous night, soon after the Potters were killed. If he didn't collect Harry until just before dawn, then we can simply assume that he and the baby stayed out of sight somewhere all day and didn't begin travelling until it got dark again – since a giant on a flying motorbike would be rather noticeable. I originally added that if Hagrid tried to actually ride the bike on the road he would immediately be arrested for not wearing a crash helmet, since this law has been in force, and rigorously enforced, since 1973. But I see that JK Rowling's own drawing of Hagrid showing baby Harry to Dumbledore and Minerva at Privet Drive has him wearing a biker's jacket and some kind of helmet with adjustable goggles - although it's possible it's meant to be a pilot's leather flying helmet rather than a crash helmet. The only reason people assume Hagrid must have got Harry out of the ruins very soon after his parents were killed is because he says he got him out "before the Muggles started swarmin' around". But the Potters' house was the last or last but one house on a lane leading out into the countryside (we're told it's at the very end of the lane, but also that there are cottages, plural, flanking it, so it may only be the last but one, or the flanking cottages could be one next to it and one behind it). The explosion didn't destroy the whole house, just a portion of the upper floor, and since it was a magical explosion, and Harry fell down a whole storey among rubble and yet wasn't seriously hurt, it may well have blown out gently and almost silently, and the rubble floated down like thistledown. It's true that the hedge was low enough for Tom Riddle to see over, so the house wasn't actually hidden from the road. But it was late at night, and the house was the last or last but one in the lane, so nobody would walk past it and see the damage that night unless they were heading out into the countryside, or they were going to the last house in the lane if the Potters' house wasn't the last. This is doubly true if the damage was on the field rather than the village side (which isn't established) – if that's so the damage wouldn't be visible even in daylight, except to somebody heading to the very end of the lane, or out into the country beyond it. It's probably not the case that the house was invisible at that time, and became suddenly visible when it was blown up. Later on, the preserved ruin was made invisible to Muggles, and Harry does think that even the fact that he, a wizard, can see it means the Fidelius Charm died with his parents. But Flitwick, a Charms expert, says that when the Fidelius was in place Voldemort could have pressed his nose against their sitting room window and still not found them – which suggests that the house was visible but the people inside it weren't. And even if an extra house did suddenly become visible it is, like the explosion-damage, something nobody would notice in the dark, unless they had business at the very end of that lane or in the countryside beyond it. Also, it was Hallowe'en, which means five nights before Guy Fawkes Night. There would already be kids letting off fireworks all over town, and anybody hearing a bang would assume it was a fire-cracker. Only the people who lived within a few doors of the Potters would have any reason to connect the bang with their house, and then only if it was loud – which it very possibly wasn't – and assuming that they were both at home and awake. There's a very good chance, therefore, that "the Muggles" didn't begin "swarming around", or realize anything was amiss, until the postman or milkman came to that end of the lane at around 8am the following morning: so all we know is that Hagrid dug Harry out some time before then. There may well have been a substantial delay between the Potters' deaths and the Order hearing about it and sending Hagrid, and between Hagrid's arrival and his successfully excavating young Harry. And since Hagrid probably can't use a wand well enough to Disillusion himself, and a giant on a flying motorbike is rather hard to disguise otherwise, he may well have chosen to lie low until the following evening. The report about owls flying "since sunrise" is interesting. It may just mean that they weren't noticed in the dark: but if they really did only start flying back and forth at sunrise, that means it wasn't until dawn of the morning following the attack on the Potters that the wizarding world in general learned that Voldemort was gone. That would tie in with the idea that it took most of the night for the Order and/or Ministry to work out what had happened and retrieve Harry. Mind you, Hagrid still ought to have been able to make the journey in two or three hours – but perhaps he waited to set off not just until dark but until most of the motorway traffic had died down. The only problem with this is that Hagrid says Sirius turned up with the flying motorbike just after he, Hagrid, had finished digging Harry out of the rubble, and that "Black knew he was goin’ ter have ter run fer it that night", suggesting that it was still the night of the Potters' deaths at that point. But sunrise wouldn't have been till about 7am so it could easily have been 5am and still dark and therefore "night" in that sense, even though the milkman might be round in an few hours. That the flying bike came from Sirius, and that Hagrid hadn't expected to have it, raises another possible explanation of the lost day. Dumbledore may have arranged to meet Hagrid at the Dursleys' place a whole day after he retrieved Harry from the rubble because he, Dumbledore, had been expecting Hagrid to walk from Godric's Hollow, or to proceed in some other way which would genuinely take all day. 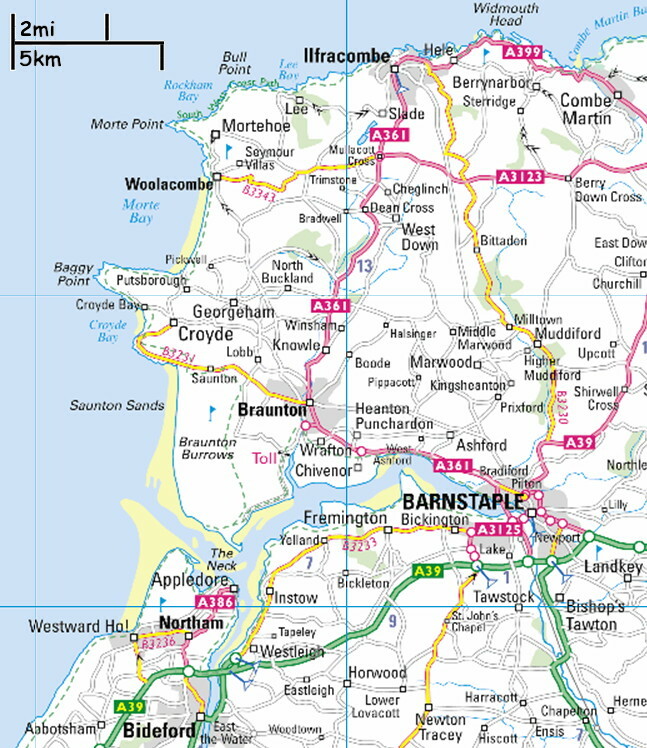 The most likely location for Godric's Hollow is somewhere near Weston-Super-Mare in Somerset: either near (but not on) the coastline facing into the Severn Estuary, or on the estuary of the River Parret which feeds into Bridgewater Bay a few miles south-west of Weston-Super-Mare. Hagrid passed over Bristol en route to Little Whinging because he used the motorways as a guide, picking up the M5 near Godric's Hollow and following it to Bristol, and then the M4 from Bristol to Heathrow. Because the Potters' house was located at the far end of a long lane leading out into the countryside, and because Voldemort's attack happened in darkness at a time of year when loud bangs are expected, the partial destruction of the house was not discovered by Muggles until after dawn the following morning. The Order of the Phoenix found out about it at least slightly sooner and Hagrid was able to dig Harry out of the rubble before dawn, but he had to hide somewhere out of sight until after dark the following evening before proceeding, as he was not competent to cast Disillusionment on himself, and/or because he had been expecting to travel by some slow method, and by the time he got hold of Sirius's flying motorbike the rendezvous with Dumbledore at the Dursleys' place had already been fixed for the following night.